In this episode, Lisa answers the question: What do the StrengthsFinder colors mean? She describes the three things you need to consider when looking at your colors: your thoughts, your demands, and your filters. 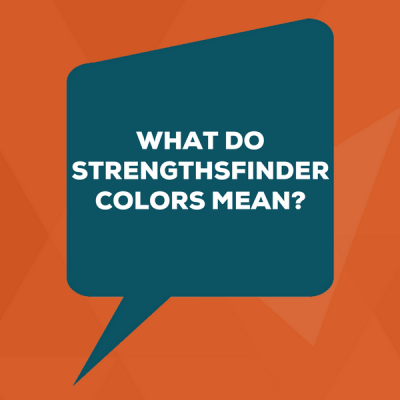 Today’s question is: What do the StrengthsFinder colors mean? This question comes up straight away when people finish the StrengthsFinder assessment because smart people see the DNA icons on the Gallup Strength Center dashboard. Or you may have noticed that there are some colors on your Signature Theme Reports or the Insight Report. There are four of these potential categories, which Gallup calls Leadership Domains. The blue ones are Relationship talent themes, yellow are Influencing talent themes, red are Strategic Thinking themes, and purple are Executing themes. Those words make the acronym RISE, so it makes it easier to remember: R-I-S-E for relationship, influence, strategic thinking, and executing. Once you have that information, then what? Well, here are three ways to think about your color lineups or the StrengthsFinder colors you see for the people on your team. Number one: your thoughts. These are your thoughts and reactions to actually seeing these colors. The two most important things: 1) don’t panic, and 2) don’t stereotype. So, for example, you have no red in your lineup? No worries. Don’t panic. Everybody thinks, even if they don’t have Strategic Thinking talents in their top five. Have no blue? You might say, “Oh, no, I can’t even build a relationship? I’m a people manager. That sounds terrible.” Well, everyone has relationships, unless you’re a hermit living in the woods. There’s a concept that came up from a senior practice consultant at Gallup, I think it might’ve been Jacque Merritt. The idea is that there’s not a brick wall that separates these four categories, it’s more like a chain link fence. You might have one category that is highly present in your top five that makes you think, “Oh look, I’m missing one.” So, for example, I personally have no Executing talents on my top five, but I don’t say, “Oh no, I’m doomed. I don’t get anything done.” My company would go out of business if that was the case, so we know that’s not true. With this idea of it being more like a chain link fence, you can see how the concepts can flow into each other and you can make one color act like the other. So that’s the first one. Don’t panic. Your strengths look the way they look and they are perfect for you. The other big idea is to not stereotype someone based on these colors. If you see something on a teammate, don’t stereotype them and assume they’re going to be a certain way, because they are going to combine their whole 34-strength lineup to create who they are. Don’t oversimplify things. Number two: your demands. Gallup calls these colors the Four Domains of Leadership because they originated from Gallup’s study of team leadership. Their research found that the most cohesive and most successful teams had clusters of strengths. There are 34 potential StrengthsFinder talent themes, and there are specific clusters in four areas. These clusters are useful for thinking about how each person might naturally contribute to a team and how a leader’s personal lineup of talent will impact their leadership approach. Those four domains (and the four colors) are relationship, influencing, strategic thinking, and executing. I actually call them the four demands, because most performers at work have to do all these things, not just those of you who are people managers. So, rather than limiting them to be leadership domains, I like to call them demands because it includes people in team sessions in a way they can understand. And they can relate to them personally because they, too, have reports that have colors all over them and they also need to make sense of them. Even when you don’t have a given color in your top five, you likely have that demand on you in your workplace. What you can do with this is ask yourself what talent you have that can act in a way that compensates for the missing color. For example, my Strategic Talent helps me sort out options really quickly so I can decide how I’m going to do things and how I’m going to take action. I can do that quickly, rather than getting bogged down in analysis or holding more meetings about meetings. It helps me take fast and decisive action. So, it helps me execute, but it’s actually a Strategic Thinking talent. Let’s look at some others. I have Positivity, Individualization, and Woo in my top five. Those three really combine as a lineup to make me a person with a lot of relationships in my life, relationships that I’ve nurtured over a long period of time. So, when something needs to get done, they help me find smart people who can get a given task done better than I can. Or, if I need to call on help from people, I inevitably have someone in my network where I can get a question answered easily. These are based on my Relationship and Influencing talents, but they still are helping me execute. In the last example, I would use my Maximizer talent. That’s an Influencing talent by category, but it also makes me want things to be better all the time. It creates a strong drive in me to get things done, to realize the latent potential that I see all over the place — the things and people and processes that could be better if we just put a little more execution effort into them. Even though Maximizer is not an Execution talent, it works like an Execution motivator for me. You might not have a given color that represents that domain or that demand, but you can certainly apply it in that way. Number 3: your filters. These four colors are also like a first filter — they define how you see and approach the world when something happens to you. They are your initial reaction. Let’s use an example of a big reorganization at a company, and I’ll run through each of the four colors and talk about what it might look like if you were really heavy in that domain. Relationship talents: Maybe you had a lot of blue Relationship talents, and a big reorganization gets announced. Let’s say you work for a very large Fortune 500 company and you’re going to have a merger or acquisition that will make your company double in size. You’re going to go from huge to gigantic, and you know that’s going to bring a lot of reorganization and questions about what is going to happen to different responsibilities at work, who does what, what teams you’ll be on, or whether you’ll be redundant. If you get that announcement and you have three or four Relationship talents in your top five, most likely you’re going to be thinking first — your first filter — “Who is this going to affect? How are they going to react to the change?” Especially if you’re a people leader, you’ll be thinking of each person on your team who reports to you and how they’re going to take this news and what they might be thinking about it. Strategic Thinking talents: If you had four or five red Strategic Thinking themes, your first reaction to something like that might be to go do some deep pondering. Or it might be to crunch some numbers and really consider what this is going to do. You might learn all you can, collecting tons of information. It’s a cerebral exercise. When something big happens, you go inside your head. Executing talents: If you had three or four Executing talents, instead of thinking of this big picture merger, you would likely go straight from that 30,000-foot view of a merger down to the 3-foot view. How is it going to affect the operations? Who is going to do what? What will it look like at a task-level and a man-hours level? How will it affect the operations? What about redundant systems? How are we going to approach this great idea of what these two companies can become? And how do you make it practical and work for the everyday? What if you’re heavy in one color? Remember that Strengths-based development is all about what comes naturally to you. Your natural talents are how you think and feel and behave at your natural best. They are your easy buttons for great performance. If you start lamenting what you’re not, you’re doing the opposite of Strengths-based development. You don’t have to covet the people that have the Skittles-mix with all sorts of colors in their top five. What if you have all the colors? Now, if you do have all four of the colors presented in your top five, you may have a hard time relating to the concept of the first filter — your first filter may not be strong in one of those areas like it would be if you had three, four, or five in one color. If you have the Skittles-mix of colors, I would suggest you just consider which of your top five talents speaks loudest when there’s a big change. For example, for me, it’s probably Woo because I’m instantly thinking, “How are we going to message this? How can I make this change palatable or likable to people on the team? How can I make this exciting?” I also might be thinking things like, “Who else do I need to meet and learn from to become who I need to become to reach this next goal?” So, I would say that Woo is the loudest and my first filter. You might recognize one talent as the strongest, even if you have a big mix of colors. If you just took the StrengthsFinder assessment for the first time and noticed these colors and are wondering what they mean, you’re smart and you picked up on something very nuanced. Your thoughts: Manage your thoughts and your reactions to seeing the colors. Don’t panic. Don’t stereotype. Your demands: You actually have the four demands on your personal leadership, or the four domains if you want to refer to them that way. Those are Relating, Influencing, Strategic Thinking, and Executing at work. Your filters: Think of your Talent Themes and see if they offer you a first filter when major things happen to you. If you want some other Strengths-focused tools to use with your team at work, check out your Resources Page. There you’ll find at least one handout that shows you the talent themes that fall under these four demands/domains, plus a lot of other tools related to StrengthsFinder and Strengths-focused leadership. I look forward to hearing how you and your team members will claim your talents and share them with the world!